6x12 Wicker Brushed Nickel Floor Register Discounts Apply ! 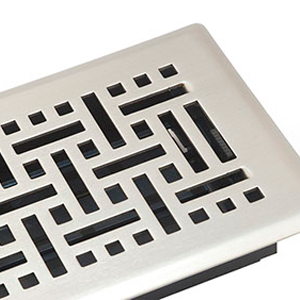 Brushed nickel registers in a wicker pattern offer beautiful alternatives to traditional register designs. These 6 x 12 metal vent covers have a fully operational plastic damper. This beautiful brushed nickel register's finish is protected by a durable lacquer finish to protect from corrosion. 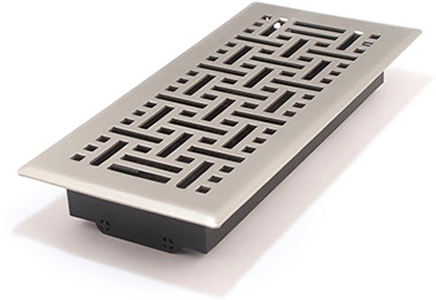 Your new metal vent covers have a steel core and can hold at least 200 lbs. Brushed nickel registers can be used throughout your home for a consistent look. ***Hint: The industry standard is to order metal vent covers is to use the actual hole opening size and not the faceplate size. This brushed nickel register will fit a 6 x 12 inch hole opening. Order your brushed nickel registers today for great new look!